Interesting nomenclature they’re using for the names of the characters. Roll and Barrell “Gaskett”, the “Bonne”s (instead of the often used “Born” or “Bone” that you see a lot more of in Japan), and even “Servbots” instead of “Kobuns”. 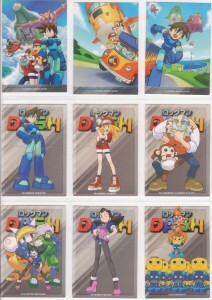 They matched the English names pretty well (reasoning that “Gaskett” was used in the English game’s credits, even though it was “Caskett” everywhere else in the game), but they did remember to use “Rock” Volnutt instead of “MegaMan”. Read it. Weep. Just don’t do anything extreme. After that article, I’ll have to change things to today’s post I was working on. I guess I’ll finish it tomorrow. I’m just not happy today. Hey these look nifty, bet they cost a pretty penny to get nowadays. « Stuff that goes on.